In the PADI system there is a program called Scuba Review. Many divers call this program a refresher course or a refresher dive. 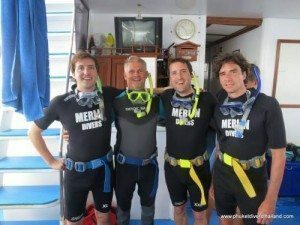 Here an introduction to how Merlin divers, located on Kamala beach on Phuket do such a refresher program. Many people having once done a diving certificate but then didn’t go for diving for several years think that to get back into diving will be very hard, difficult and time-consuming, However read through the outline of this program and you will realise all you need to do is join Merlin Divers for a trip with 2 dives – that’s it. You go on the boat and will make 2 dives like all the other divers on the boat. But we will not put you in a group – you will get more personal attention. One of our staff members will take care of you. Normally the program is conducted on 1:1 student-instructor ratio except if there is another person in the same situation as you. The start in the water will be in shallow water directly on the dive site – depth not exceeding about 4-5 meters. In this shallow water you will get demonstrated by the instructor these “most important” diving skills and practise them yourself. This will take about 5-6 minutes. The main idea of the program is: you get the time to get used to breathing under water again and we have got the time to give or take some weights, to make sure you are properly weighted and ready to start your first dive. After the little drill of skills you go straight into your first dive. If you are more or less breathing the way a diver is supposed to you will be under the water for one hour. After the break on the boat follows a second dive – and by that time all your diving skills will be coming back and you will feel relaxed and comfortable to be diving again.